Can you see it? The rather interesting camouflaged sock above is from new people The Workers Club. 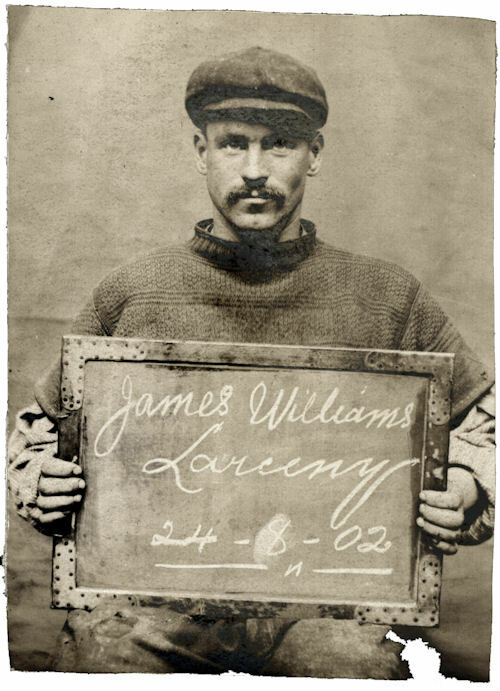 The Workers Club was formed in 2015 by husband and wife team Adam and Charlotte Cameron. Please welcome them, gentlemen. Adam and Charlotte believe that 'form and function should be in equilibrium' and they may well have achieved that balance with this sock. What's more, at The Workers Club they think clothes should 'exist beyond the cycle of trends'. That doesn't mean they're as fogeyish as you and I, but they're not slavishly aping the latest fashion diktats either. They use words like fastidiousness and time-proof in describing what they seek to offer, which are the right kind of noises in my book. 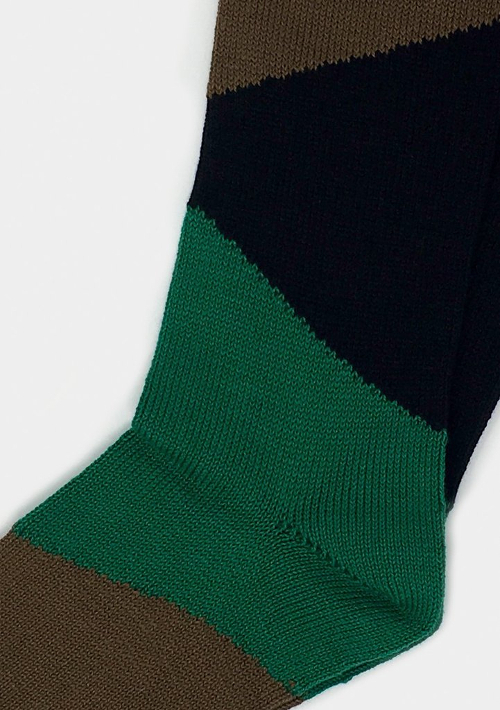 Military colours are timeless in their own way, so the drabs and navy you find on these socks will always be easy to match with, say, a stone-coloured trouser and country shoes. And they're a bit quirky too. It's good to have a little bit of quirk in an accessory, a sock or pocket square, say. 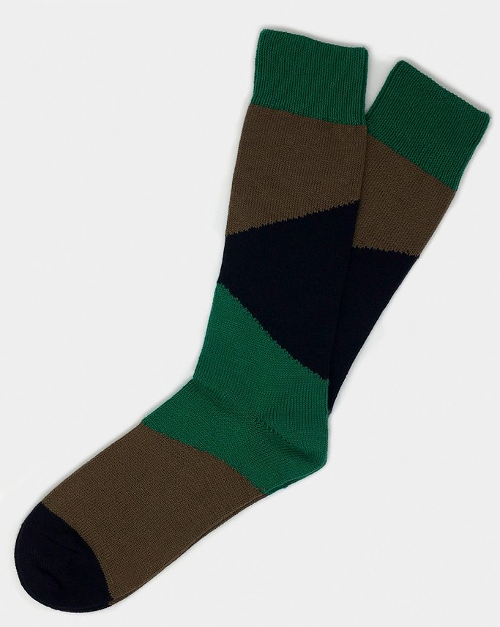 The Camo Pattern Forest Mix socks are knitted in England from combed cotton with a dash of nylon for robustness. They have a brother in the Camo Pattern Red/White/Blue (below). I might prefer these more now that I look at them. But if I look up again I might prefer the Forest. You know me. The Red/White/Blue remind me of an exploded Argyle pattern sock where you've zoomed in with a microscope. I like that idea. I suppose you could also see it as a dissection of a Union jack. Now we might be getting a little bit Rorschach with the interpretations. I imagine you see only the red and navy elements at the ankle. 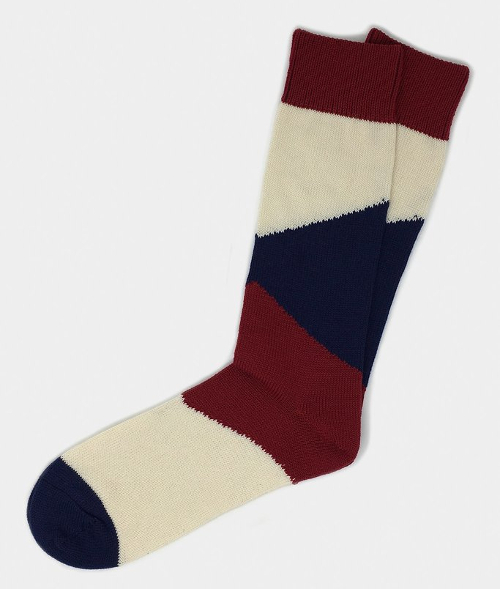 A very nice sock.